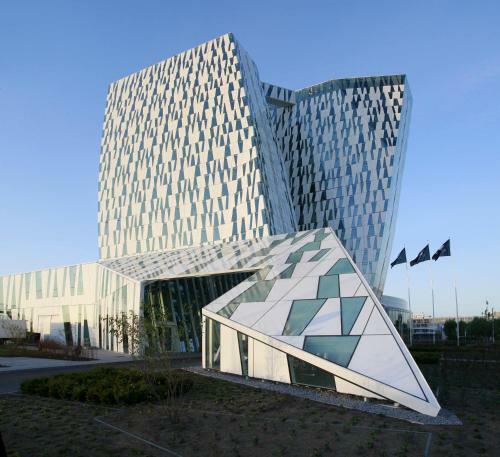 Spectacular gravity-defying architecture and a spa and restaurants are powerful lures at the non-smoking AC Hotel Bella Sky Copenhagen, where Wi-Fi is included. The largest hotel in Scandinavia with a staggering 812 rooms, this Marriott Lifestyle Hotel is a non-smoking, 23-story ultra-modern-design property. It has units with free Wi-Fi, flat-panel TVs, sun-filled floor-to-ceiling windows and coffeemakers. Relax after a day of work or exploring with a calming cocktail on the rooftop sky bar; the two crazily angled towers of the hotel are connected at the top level by a sky bridge. The on-site fitness and health center has workout equipment plus hot tubs, saunas and steam rooms. No less than three hotel restaurants provide ample choices for dining; room service with a view of Copenhagen is an excellent idea. The hotel is four miles from the city center and Copenhagen Zoo in one direction and four miles from Copenhagen International Airport in the other, accessible via the hotel's free airport shuttle. Amager Fælled, a vast nature reserve, and Copenhagen's Bella Center are both just a few steps away. The Bella Center Metro Station is a two-minute walk from the hotel. A helpful staff, free airport shuttle and a top-notch breakfast are the hallmarks cited by our guests at this architecturally unique Copenhagen landmark. 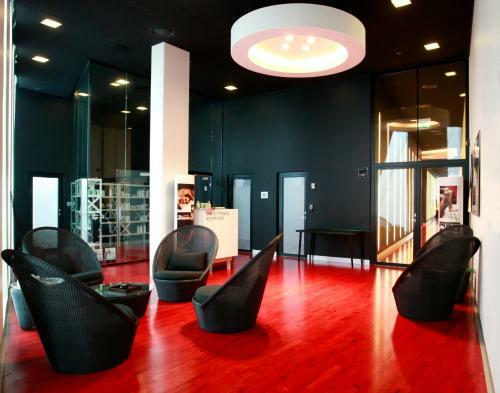 AC Hotel Bella Sky Copenhagen is an amazing Copenhagen lodging choice for your trip to Denmark. With numerous amenities for guests such as room service, 24 hour front desk, restaurant, you will wake up at AC Hotel Bella Sky Copenhagen feeling excited every day for your time in Copenhagen. Don’t let this amazing reservation opportunity pass you by, book your stay at AC Hotel Bella Sky Copenhagen today to make the most of your time in Copenhagen, Denmark.